From sea to shining NYC. 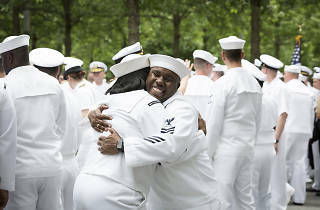 On Wednesday, thousands of sailors will land in New York City for the annual, seven-day Fleet Week celebration. There are many great events and memorial services to attend in order to honor these service men and women. 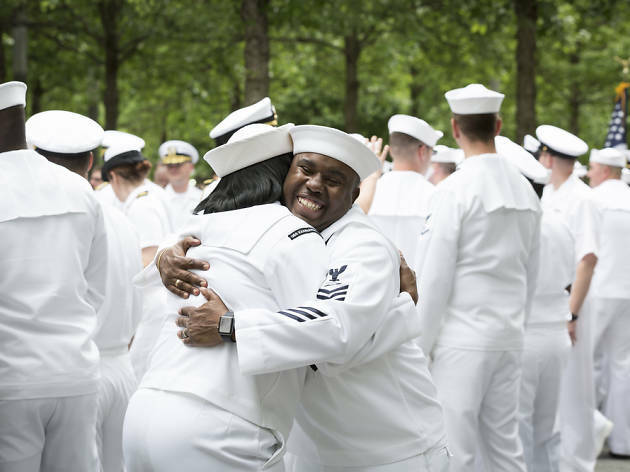 But aside from watching the Parade of Ships and catching a screening of Top Gun on the Intrepid, locals get really excited to drink with all those visiting seafaring ladies and gents. If you're looking to "snag yourself a sailor" and get chummy with these water-bound heroes, here's where to go. Spend your Saturday afternoon soaking up the sun, sipping booze and lounging on an actual porch swing at Bryant Park’s Southwest Porch. The event features two live music sets (at 3:30pm and 5pm), and service members in uniform receive discounted drinks at the bar. Bryant Park, Southwest Porch, 41 W 40th St (212-840-0324, bryantpark.org). Sat 26 3–10pm; free. All aboard! Fleet Week revelers and sailors who are missing life on the water can sail along the Hudson River during this two-hour booze cruise. Enjoy an open bar, munch on the food and snacks available for purchase, and get down to a live DJ. Bring your camera to capture unreal views of the Statue of Liberty, Ellis Island, the Brooklyn Bridge and Manhattan’s skyline glistening in the moonlight. Empire Cruises, 2430 FDR Dr (212-686-9200, empirecruises.com). Fri 25 8–11pm; $49–$69. Service members can boogie for free at this silent disco party that serves $8 cocktails before midnight. To participate, sport wireless headphones and tune into one of three live DJs playing Top 40 tracks, throwbacks from the early aughts, and hip-hop and reggae grooves. Consider yourself the next Skrillex? You can listen to your own playlist, too. Stage 48, 605 W 48th St (quietevents.com). Sat 26 11pm–3am; $15-$40. Free for service men and women in uniform. Irvington, Kingside and Mr. Purple are offering service members in uniform 50 percent off all cocktails ($16 and under) as well as The Roof, Whiskey Blue and The Campbell ($18 and under). The infamous Coyote Ugly is doing a two-for-one drink deal from 7 to 9pm for men and women in uniform. And Opry City Stage serves 20 percent off on food, drinks and retails for military members. Folks can also soak up the sun atop Haven Rooftop while taking advantage of happy hour specials: $6 beers, $8 glasses of wine and $10 margaritas. Party on! Various locations and times.